Shop Peavey Sanpera II Vypyr Foot Controller Bag from AMS and enjoy Fast & Free Shipping. Keep your Sanpera II foot controller looking and performing like new with the Peavey Sanpera II bag. 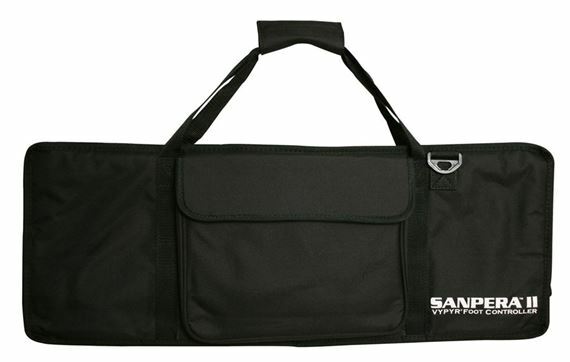 Specially designed for transporting the Sanpera II foot controller, this bag protects it from the elements and roadies. The heavy duty nylon material absorbs minor impacts so your ready for each performance. The Sanpera II Vypyr foot controller bag includes a padded carrying handle, should strap and a front accessory pouch. This bag fits the Sanpera II Vypyr Pedalboard perfectly (not too compressed, and not too loose). The extra pocket on the front is very handy for storing the cable and perhpas other cables that you need. The material is solid. I don't see this falling apart any time soon. As simple as it gets... put the pedal in and zip up. More pockets (although the on it is pretty large and can hold quite a bit of stuff).